The signal conditioner of the DRF series DIN rail signal conditioners are designed to accept a broad range of input signals, such as ac and dc voltage and current, frequency, temperature (thermocouple and RTD), and process transducers, and provide standard process outputs of either 4-20mA, or 0-10V. The DRF series feature a modern housing design, that is easily mounted on standard 35 mm DIN rails. Connections are safely and securely made through pluggable screw terminal connectors, with input and output connections on the opposite sides of the module. 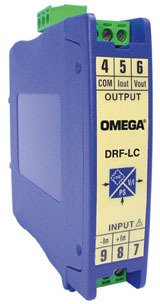 The DRF-LC signal conditioner accepts a load cell input and provides an isolated 0 to 10 Vdc or 4 to 20 mA output. Models are available with three different power options, 24 Vdc, 115 Vac and 230 Vac.